You can download and use OZEKI Camera SDK, but you can also build your own Onvif IP camera, IP camera, Webcam software in C# and redistribute them with the outstanding camera support without any extra fee. Just add the .DLL file to the references and start to build your solutions. 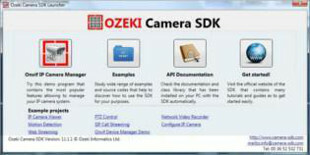 Do not hesitate, download the OZEKI Camera SDK! OZEKI Camera SDK camera software provides several example programs in C# for all the possible Onvif IP camera, IP camera, Webcam purposes. All these projects are installed on your computer automatically with OZEKI Camera SDK but you can also download them from the developers guide with detailed C#-based step-by-step tutorials. One of the greatest advantages of this Onvif camera software is that you can develop programs such as the Ozeki Demo Onvif IP Camera manager. This demo program can be used for free and it can be redistributed. You can also download and modify the source code as you wish. 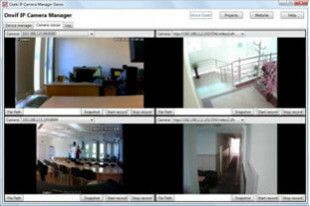 Learn more about Ozeki Demo Onvif IP Camera manager. OZEKI Camera SDK provides a comprehensive documentation that contains standard API documentation and online developers guide for all the possible Onvif IP camera, IP camera, Webcam solutions that can be built with this Onvif camera software. This documentation describs all the tools you can use in your application. When you have decided to switch to the full version of OZEKI Camera SDK, you will receive your license key via email. You do not need to download a new instance of the OZEKI Camera SDK as the trial version also contains the License Manager that will be used for the activation process. The following guide will help you to accomplish frame capture from a video stream for implementing image analysis. This guide will help you in the subject of displaying images as a video until a new image is injected into the video stream. In this guide you will find detailed information on how to select an area of interest on a captured video frame with a bitmap image. This lecture provides you all the necessary information to successfully implement line detection in C# with the Ozeki Camera SDK. If you wish to gain more information on how to implement Barcode/QR code detection in C#, look at his guide. Discover how easy the implementation of circle detection can be with your C# camera application using the Ozeki Camera SDK. Wondering about implementing edge detection in C#? Look at the guide below and you will easily benefit from the edge detection function of the Ozeki Camera SDK. If you wish to discover the subject of corner detection with your C# camera application, using the Ozeki Camera SDK, please follow this guide below. This guide will be your effective help in implementing face detection successfully with your C# camera application using the Ozeki Camera SDK.